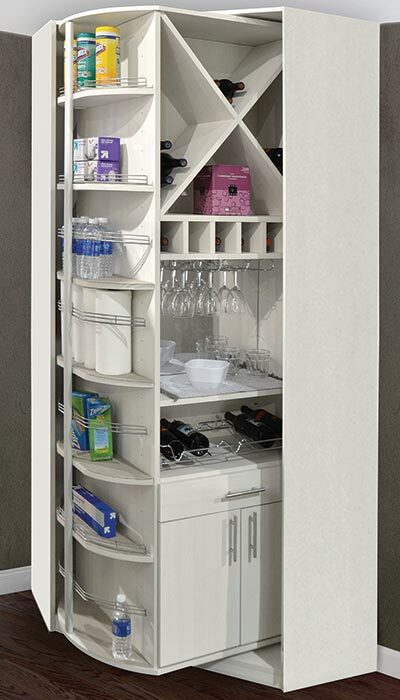 The 360 Organizer® can easily be configured to function as the perfect butler's pantry closet organizer system — access to all your bottles and serving pieces is simple when you have 360 degrees of rotating storage! Create the Perfect Kitchen Closet Organization System for Entertaining Using Rotating Butler Pantry Cabinets with Wine Storage Racks and Under Cabinet Wine Glass Holders! This 360 Organizer® doesn't need to be hidden behind closet doors. Configured as a butler's pantry with an attractive custom cabinet and drawer unit, it sits in a corner and offers quick and efficient access to the client's entertaining needs. 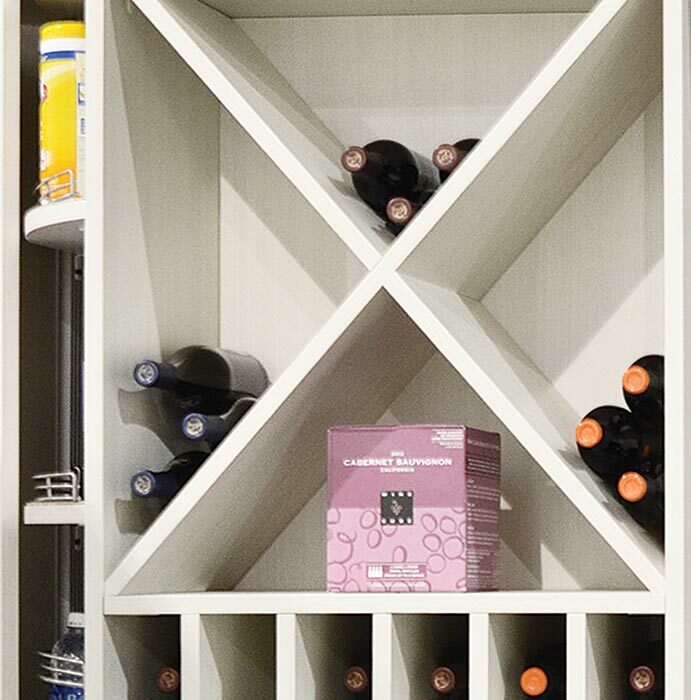 A wine cube, plus pull-out wine rack and undermount wine glass holder ensure efficient storage with easy access to bottles and serving pieces. 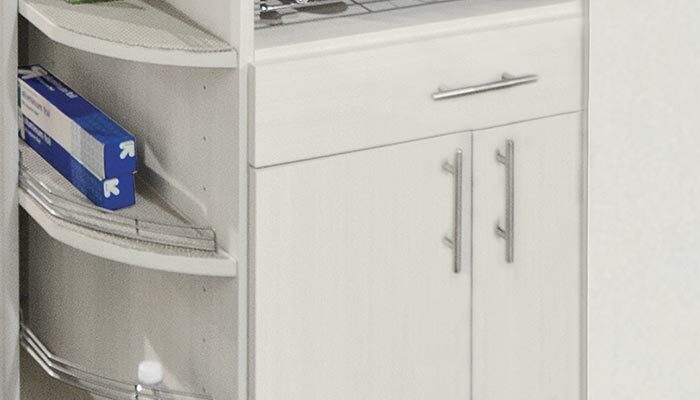 The rotating nature of this butler's pantry and the small footprint combine to create the perfect kitchen closet organization system for a room without any built in storage. The unit rotates manually so that nothing gets lost in the back when the pantry is fully packed. Wine storage racks keep bottles out of direct sunlight to protect the flavor while horizontal storage ensures the corks don't dry out. 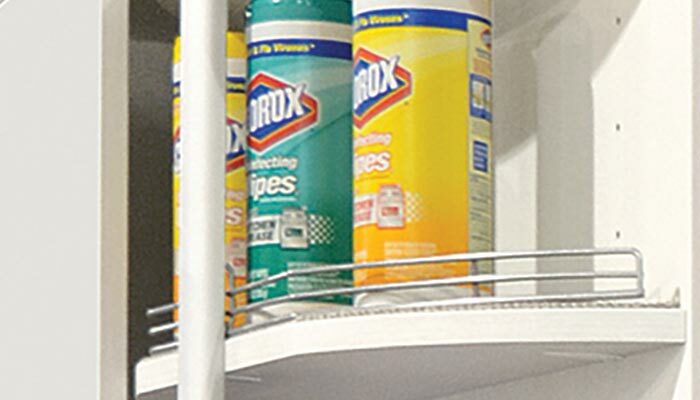 Shelf fences keep items in their place during rotation. Custom butler pantry cabinets and drawer unit.